These backing boards are 7" x 10.5". 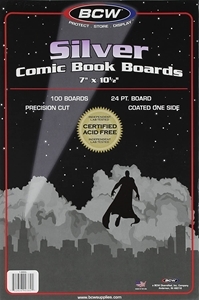 Precision-cut, acid free, and coated on one side, they are designed for Silver-Age comics and are intended for use with BCW's Silver bags. These are the backing boards we use for our over-sized and prestige-format subscription books. Due to their size and weight, backing boards are not eligible for free shipping.